Make the frangipane: in a food processor, combine the almond meal, almond paste and sugar and process until well mixed. Add the egg and butter and process until smoothly blended. Cover and refrigerate while you make the cake batter. Make the cake: preheat the oven to 180°C/350°F (160°C/325°F if the pan has a dark finish). Butter and flour a 10-cup capacity Bundt pan. In the large bowl of an electric mixer fitted with the paddle attachment beat the butter on medium speed until creamy and smooth. Gradually add the sugar, beating until light and fluffy. Scrape down the sides of the bowl occasionally. On medium speed, add the eggs, one at a time, beating well after each addition. Add the vanilla. On the lowest speed, add the flour mixture in three additions alternately with the milk in two additions, beginning and ending with the dry ingredients. Scrape the sides of the bowl again. Remove the frangipane from the refrigerator. Spoon about 2 cups of the cake batter into the prepared pan, spreading it evenly. Spoon half of the frangipane in dollops over the center of the batter, and then spread it over the cake batter avoiding the center tube and sides of the pan. Spoon about 1 ½ cups of the batter evenly over the filling. Spoon the remaining frangipane over the batter, spreading it evenly. Spread the remaining batter over the top and spread evenly. Bake the cake for about 60 minutes or until risen, the top springs back when lightly touched and a skewer inserted in the center of the cake comes out clean. Cool in the pan over a wire rack for 15-20 minutes, then carefully unmold onto the rack. Cool completely. Dust with confectioners’ sugar before serving, if desired. Place all the ingredients in a food processor and process until smooth. Refrigerate in an airtight container for up to 2 days or in the freezer for up to 2 months. Let paste come to room temperature before using it. 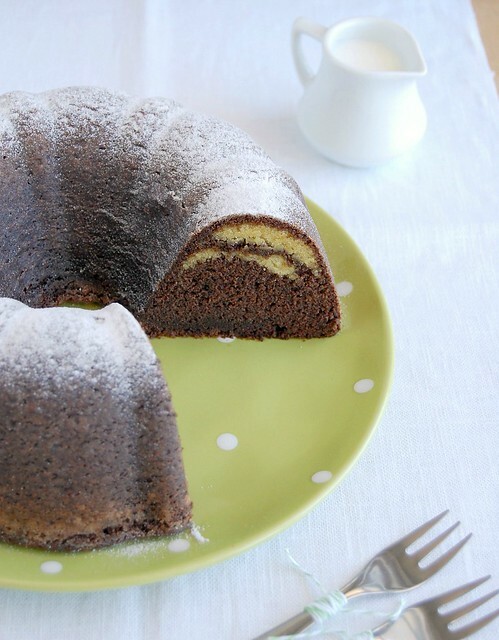 The texture of the bundt looks great! Yum! I'm in love! This cake looks seriously good. I'm bookmarking it as we speak. Haven't seen The Artist yet but looking forward to it. The b&w and silent parts are the most intriguing. I love the ripple - what an elegant cake. Love your polka dot platter as well! Oh if this post was a week earlier. I looked everywhere for almond paste to no avail. finally found some last week and now you in your genious was provide the recipe to make it from scratch! -- I could kiss you. How about we have pound cake instead? :) Yum..now I'm hungry. Interesting, I've never heard of almond paste before! It sounds like something I could spread on absolutely everything though! It looks wonderful! I want a piece of it (or the entire cake)! 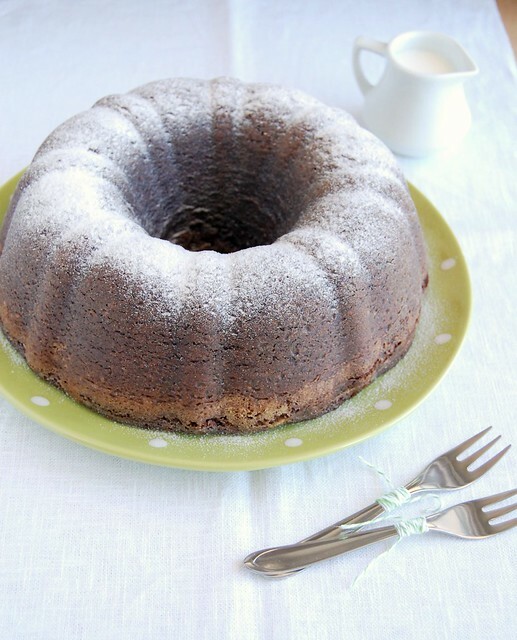 Tara, almond pound cake is an amazing idea! YUM! German, you can use natural cocoa because the recipe calls for baking powder. Thanks, Patricia, for the info about almond paste. I had a same problem and now you solved it!